My New(est) Go-To Wintertime Polish – amandarobots. I thought Essie’s Bahama Mama would be a close dupe, but it fell tragically short in the formula department. That was the last straw – I caved and bought the real deal. 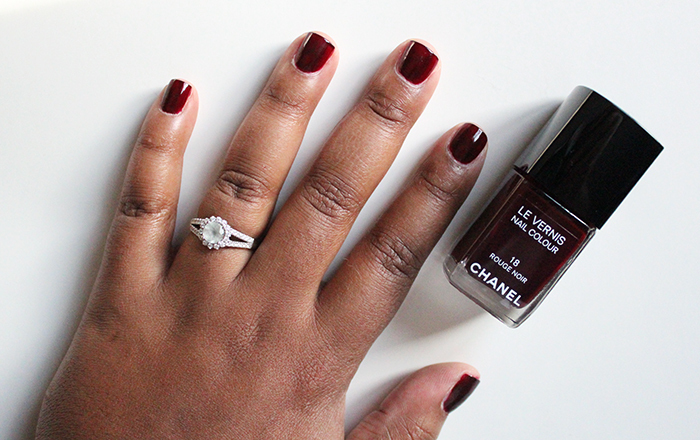 Chanel Rouge Noir is a deep, almost-black red that is absolutely perfect for the colder months. There’s just something about a dark polish that’s so chic, and this one’s no exception. I have become a little obsessed: last week, I took it off and almost immediately reapplied it. The brush and formula are dreamy. It is a little chip-prone, but the trick to a lasting manicure with this shade is to paint the free edge of the nail (also known as wrapping the tip!). This extended my wear by three days in addition to just generally improving the overall look of my nails. Let’s face it – this is probably going right back on my nails next Sunday.